Accommodation in Stellenbosch: Eikendal Lodge. You are here: Home / South Africa / Accommodation in Stellenbosch: Eikendal Lodge. For the ultimate escape & rejuvenation, Eikendal Lodge, nestled amidst prized vineyards, offers an idyllic Winelands retreat to recharge the senses. Jaded city dwellers and travelling guests alike find comfort in this unsung jewel, comprising nine spacious en-suite rooms, each with its own private terrace whilst surrounded by ‘royalty’ with all the noble cultivars at their doorstep. 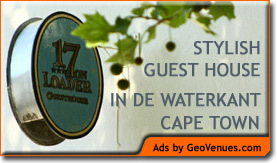 For guest house accommodation in Cape Town, be sure to stay in de Waterkant Village – at 17 on Loader Guest House!